This blog was originally posted at www.BirthofaNewEarth.blogspot.com on Sept. 22, 2014. Since that entire blog was deleted in Feb. 2018, this particular entry is being reposted here because of its importance. First, 1) PLEASE CONSULT THESE SIX ONLINE LISTS AT THE LINKS. MY BELOW LIST IS JUST A SUPPLEMENT TO ALREADY PUBLISHED INFO ON THE WEB. CHECK THE FOLLOWING FOUR LISTS FIRST, THEN CONSULT THE BELOW LISTS (there may be some overlap but not much) ALSO you can google search for VAX Friendly Doctor plus your city name. and 2) If you don’t find a Dr. in your area that your insurance covers, etc. and are forced to choose somebody else, the general rule IME is that a regular family doctor MD, Chiropractors (and of course N.D. Naturopaths and Homeopaths) are all a better bet than a “Pediatrician”. Dr’s who see adults are used to their patients most of whom are without “proper” boosters, and they’re not all falling over dead from pertussis or whatever, KWIM? If your child has no special diagnosis, no special pediatric issues to be followed closely, then a general developmental checkup by any licenced practitioner is enough. Or you can avoid Dr’s entirely and learn yourself to check hips, chart height and weight, etc. No need for all these Dr. Visits – they are training sessions to get you used to vaccinating and running to the Dr. for colds, etc, that is all. UPDATE, the NOVAX site previously listed here has been BLOCKED – reported as Abusive. What bunk. Was located here http://novaxdoctors.webs.com/doctorlist.htm, ACCESS IT HERE! disclaimer: I cannot say if all the info is current or accurate. All medical decisions are patients & parents’ to make in conjunction with their physicians. I found the mama comments useful so I kept them in. I did not include one or two docs who seemed unfriendly. OK here it is: Great Job, mamas! 1) Bay Minette: Dr. Jessica Hagemeier at North Baldwin Pediatrics. She didn’t push the vaccinations on us once she knew we didn’t vaccinate. She was very loving and considerate of our views. We saw Dr. Kelly England in Mesa, AZ today with Banner Health because she was on the Dr. Sears list but she was horrible! Her office staff was barely professional, 40 minute wait in the lobby, one hour before she actually showed herself. She was condescending, sarcastic, and had a controlling demeanor. When I questioned “why” she needed to do something my son was uncomfortable with she took it as a threat and said “it’s my job!” I insisted she not do it (out of respect for my son – it’s his body) so she said I needed to find another doctor. She made no attempt to provide us any information or be reassuring. She also implied (through pointed, sarcastic questions) that my other son was behind in speaking (simply because he didn’t want to speak to her because she was scary. )I immediately canceled my other kids’ appointments. 1) Dr. Eugene Lu Arkansas Pediatric Clinic 500 S. University Avenue. Suite 200 Little Rock, AR 72205 501-664-4117 Note: will accept patients on an alternative vax schedule only. You can choose to delay vaccines up until 6-9 mos but if you’re not going to start vaccinating by then you’ll need to find a new dr! 7) Searcy: Ben T. Wilkins at Searcy Kids and More 400 S Main St Suite 200 Searcy, AR 72143 (501) 279-0502-Please be prepared if you meet the nurse pracnotioner. She pushes vaccines. 8. Deborah Cerrato-Cabot Medical Care2037 W Main St Cabot, AR 72023-(501) 843-4555 Not Pushy about vaccinating. 5) Redlands, California: Dr Cameo Carter, Loma Linda also has a holistic clinic. 7) Dr Rommie Fakhoury in Rancho cucamonga, CA for those of you in the Inland empire of SOCAL! He’s really good. Finally found a doc who wont question me! Such a relief! he’s a family doc though, not a ped. 9 ) Torrance, CA: Dr. Emily Beth Curran is NOT supportive. She has demanded she be removed from this list. 10) Santee, CA: Dr. Donald Adema, Adema Family Medicine. We LOVE him. 11) Glendale, CA Dr Yoshi. GP/Alternative (takes all ages). 3527 Ocean View Blvd, Glendale, CA 91208 I’m not sure he even has vaccines avaialable. PPOs ONLY. Alternative GP, does vitamin IVs. If I still had PPO, this is who I’d use!! 13 ) SAN JOSE area : Dr. Nilda Vergara ok with your decision either way. 2) Dr. Ramond Ramos Savannah Ga. He’s non, select, and delay vax friendly. Also very pro-breastfeeding, with an in-office IBCLC. A HUGE public thank you to his family for sharing him all these years. His dedication to the vaccine injured and unwavering support and knowledge of more natural routes to health have truly helped millions; he is a legend. I was heartbroken when I heard the news. SO FAR Dr Lynda Otto through Parkview hasn’t given us any trouble about not vaxing. She did make it known that she recommends vaccinating to the schedule, but when we refused, she dropped it and moved on. 2) Northern Indiana Dr. Holm’s office doesn’t care either way, I don’t think they offer vaccines there. I would see Jason Palmateer he’s a nurse practioner, he is amazing! That is in Plymouth, IN. In southern Indiana (bloomington) area I would assume most doctors don’t care either way. We see the Southern Peds. and its Dr. Newbie my son almost 2 has never been vaccinated and all we had to do was sign a paper, they don’t hassle us at all! Is provax, but one of the only Peds in the area to accept non-vax families and believes it’s a parents’ right to choose. Dr. Scott Rees Wichita Clinic – Northeast. 9211 E. 21st St. N. Wichita, KS 67208 (316) 609-4531 Dr. Rees is a family doctor, not a ped. He will split up vaccines, delay or not do them at all. He does give his opinion on vaccines (he is pro-vaccine) but completely respects our decision to not use them. I have also never had to sign anything at his office saying I choose to not vaccinate my children. Daytona Beach, FL: Dr. Andrea Thorpe has seen our older 2 and she has always been very nice and seems to understand our concerns regarding vaccs. She has NEVER tried pushing the issue, and has never judged us for it!! He is an amazing pediatrician, and very crunchy. He does not push vax at all, asks if you’re doing them or not. He’s also adopted 22 autistic and challenged children and fosters 22 more. Beautiful person. Pensacola, Pace, Ft. Walton Beach, Milton areas. 2) Boston Area, Brookline: Dr. Janet LEVATIN (sometimes misspelled as Levitan, she testified at Congress that she saw several babies die in her early practice after being vaccinated, this was included in Gary Null’s film “Silent Epidemic: the untold story of vaccines” ). She is an MD and Licensed Homeopath. 2) Auletta Maria MD 23 South Main Street # 25 Manville, NJ 08835-1801 (908 – 243-0088 I live in cetnral NJ and this is my family doctor-almost 90% of her patients are family with vaccine free children. Dr. Aaron B. Kaufman, DO Southwest Integrative Health Center 5310 Homestead Rd NE # 4 Albuquerque, NM 87110 (505) 872-0751 This is our son’s doctor. He is a family doctor. He does see babies. He is not just vax-friendly, he is actually anti-vax himself. You can’t get vaccines at his practice at all. At our first appointment, he asked us if we knew that they don’t vax there and we responded “That’s why we’re here.” He said “Good” and made a note in our file. He’s also just a great doc for our lifestyle – very naturally inclined, “prescribes” homeopathics, etc. 2) Rochester, NY: 12 corners pediatrics. They recommend vaxing but do NOT push. And they are supportive no vax, delayed, single, etc. Located on Elmwood Avenue and generally accept patients within a 25 mile radius. 6) Dr Dibble in F’ville is okay with selective and some no vax from what I have heard. Dr. Lori Anderson at The Synergy Center in Manlius. 692-2037. 1) Raleigh area: Dr. Badri Donthi at Maruthi Pediatrics in Morrisville NC. 3) Cary, NC and OTHER OFFICES TOO: Jeffers, Artman, Mann pediatrics. REMOVED – NEGATIVE – THEY UPDATED VAX POLICY They do not take non vaxing pts any more. 4) CARY: I go to village pediatrics in cary. I’m not impressed with the doctor but they never have given me a hard time about not vaccinating. Dayton Area: Dr. Yount, Family Health in Arcanum not supportive but will accept non vax patients. 6) TULSA: Dr. Payne at OU Pediatrics in Oklahoma City has been very nice and hasn’t objected in any way to our kids not being vacced. However, Just Kids Pediatrics flat out refused to see us -extremely rude and called me specially beforehand to see if he was vacced (we had a homebirth). When they found out he was not, they basically degraded me for not vaccing. This caused problems for me because I had to wait before I could change his PCP and the new appointment (At OU) was for day 8. 1) Medford area (two docs) Dr. Wendy Hale, ND–amazing doctor and wonderful person all-around. Will order vaxxes if parents request; Dr. Cindy Konecne, DOwww.valleyfamilypracticellc.com/konecne.html Will respect parents’ wishes and will not push to vaccinate. 3) unsure what area. Dr. Krenie Stowe – moved to Oregon, previously in TX on the vax friendly lists. 5) Corvallis, Oregon: Our family doctor was Dr. Margaret Carr with Samaritan Family medicine… and she was so awesome and chill. We saw her for years with no pressure to vaccinate. She might just ask about your choice to not vax, but she doesn’t have that controlling doctor, God complex that we just encountered with a pediatrician in our new city. 2) Pennsburg, Montgomery County (near. Quakertown PA). Support parent Decision. Personal Care Pediatrics -David Kennedy. 925 Main St., Pennsberg, PA 18073. Telephone 215-541-1333. 6) Saxonburg, PA/ Dr. Danielle Godinez is nonvax friendly. She still asks at every visit, but doens’t pressure. 8) Bala Cywyd, PA. 19004. Phone: 901-761-1880 Fax: 901-683-2048 They do vaccinate, but will work with the Parent on a delayed/selective vaccine schedule that suits your needs and your childs needs. You can check out their website at www.allbetterpediatrics.com, or call the office for more information at 901-761-1880. Dr. Folz and Dr. Welch are wonderful, they even have a Breastfeeding Specialist Dr. Ware who helps with specialized breastfeeding problems. It’s a great office where you’re more than a chart. My daughter just loves it! p.s. from Liora, the compiler of this document: as a clue, their website uses an image from Dr. Mayer Eisenstein’s vaccine choice book here http://www.amazon.com/Informed-Vaccine-Decision-Health-Child/dp/1881217361 perhaps a hint that they are truly open minded! SUGARLAND pediatrics preferred doc is Dr. Potkotter. Dr Farrior and Dr. Harper of Humble Pediatrics in Atascocita though they “inform” and try to persuade vax they accept non vaxing. Dr. Hogan with the TX Children’s Group. Section 2: TYLER TX area: Dr. Kathleen Moore of Appletree Pediatrics 903.592.1890 I haven’t been in with our kids to see her yet. But, from what my midwife says, several of her clients use her because she is ok with them not vaccinating. c. Nacogdoches Dr Aaron Polk is a family dr who doesn’t do vaxing (even if you want it, he sends you somewhere else)! d. Dr. Brent Wadle DO http://www.tmfhs.org/TMFOpenbody.cfm?xyzpdqabc=0&id;=738&action;=detail&ref;=893 We took the boys to their first appt with Dr Wadle this morning and we love him! His nurse and staff are fabulous too. No issues with no vaxes, no circ, extended bfeeding or cloth diapers! SAN ANTONIO AREA: …We have 2 doctors I know of. 1) Practical Approach Pediatrics and Pediatric Dentistry with Dr Adetona. He also didn’t try to retract. 2) in Selma, Dr. Gloria Wright (Family Pracitce, DO). Not vax friendly (just didn’t push us/ told me to not leave the country without revisiting the issue); intact and Breastfeeding friendly. We see her an I love her so far. Dr. Natalie Rusk on Anderson Mill Drive. We have had her since day one 7 years ago and can not speak highly enough about her. Have sent many friends to her and they all love her, too. She’s great with slow or no vax and with uncirc. No problems at all, no trying to talk you into vaxing. No retracting. Harvard grad and on the ball when it comes to anything that should arise. She’s super friendly and isn’t rushed. Answers all your questions. Also pretty conservative with treatment. No rush to antibiotics or any meds. Very natural or wait and see approach but she won’t hesitate to prescribe or send to a specialist if she really feels the need to. 3) Dr. S. Ashley M.D., Liberty Lake, Wa. Mark Kamsler MD, Delafield Pediatrics SC, 2574 Sun Valley Dr Ste 201, Delafield WI 53018, 262-646-2282. 5) Dells, WI area: Dr. Waters, MD Naturopathic in treatment style, even though he’s an MD. 7) Thiensville, WI (just outside of Milwaukee). I see Dr. Gary Lewis. He is a family doctor who is very supportive of non-vaxing or an alternative schedule He also performs medical acupuncture and is generally awesome. First, PLEASE CONSULT THESE SIX ONLINE LISTS AT THE LINKS. MY BELOW LIST IS JUST A SUPPLEMENT TO ALREADY PUBLISHED INFO ON THE WEB. CHECK THE FOLLOWING FOUR LISTS FIRST, THEN CONSULT THE BELOW LISTS (there may be some overlap but not much) ALSO you can google search for Intact Friendly Doctor plus your city name. No Circumcision Dr’s are also often Anti Vax Friendly or open minded. 6) Dr Rommie Fakhoury in Rancho cucamonga, CA for those of you in the Inland empire of SOCAL! He’s really good. Finally found a doc who wont question me! Such a relief! he’s a family doc though, not a ped. 8) Torrance, CA: Dr. Emily Beth Curran, MD, FAAP, Providence Medical Institute, 21311 Madrona Avenue, Suite 100-B, Torrance, CA 90503. 310-540-1334 Dr. Curran took over for Dr. Yanina Queen. She supports spacing and delaying vaccinations. She is helpful, responsive, attentive and thorough. It is so wonderful to find something you feel comfortable with and understands your needs without judging or being over conservative. I can’t say enough about her! 10) Glendale, CA Dr Yoshi. GP/Alternative (takes all ages). 3527 Ocean View Blvd, Glendale, CA 91208 I’m not sure he even has vaccines avaialable. PPOs ONLY. Alternative GP, does vitamin IVs. If I still had PPO, this is who I’d use!! 8) Hackettstown, Warren County. Dr. Chi. When I told him I didn’t want my baby to have any vaccines he just said that the baby will like him better then and that I should breast feed for at least a year to build a strong immunity in baby. He also surprised me when he recommended I use organic coconut oil on my babies dry skin as opposed to prescribing something. Dr. Aaron B. Kaufman, DO Southwest Integrative Health Center 5310 Homestead Rd NE # 4 Albuquerque, NM 87110 (505) 872-0751 This is our son’s doctor. He is not a pediatrician, but a family doctor. He does see babies, though. He is not just vax-friendly, he is actually anti-vax himself. You can’t get vaccines at his practice at all. At our first appointment, he asked us if we knew that they don’t vax there and we responded “That’s why we’re here.” He said “Good” and made a note in our file. He’s also just a great doc for our lifestyle – very naturally inclined, “prescribes” homeopathics, etc. Dr. Lori Anderson is now accepting new patients at The Synergy Center in Manlius. From now until 7/17 you can call her office at 682-5080 and request to be put on her schedule at the Center. On or after 7/17 you can call the Center directly at 692-2037. Dr. Anderson’s first day of seeing patients at the Center will be 7/17. 3) Norman and Moore, OK. Dr.’s Fox and Fields, part of Norman Regional Health Center. 3) unsure what area. Dr. Krenie Stowe rumored to have moved to Oregon, previously in TX on the vax friendly lists. Phone: 901-761-1880 Fax: 901-683-2048 They do vaccinate, but will work with the Parent on a delayed/selective vaccine schedule that suits your needs and your childs needs. You can check out their website at www.allbetterpediatrics.com, or call the office for more information at 901-761-1880. Dr. Folz and Dr. Welch are wonderful, they even have a Breastfeeding Specialist Dr. Ware who helps with specialized breastfeeding problems. It’s a great office where you’re more than a chart, you’re part of the family. My daughter just loves it! p.s. from Liora, the compiler of this document: their website uses an image from Dr. Mayer Eisenstein’s vaccine book here http://www.amazon.com/Informed-Vaccine-Decision-Health-Child/dp/1881217361 perhaps a hint that they are truly open minded! 903.592.1890 I haven’t been in with our kids to see her yet. But, from what my midwife says, several of her clients use her because she is ok with them not vaccinating. Mark Kamsler MD, Delafield Pediatrics SC, 2574 Sun Valley Dr Ste 201, Delafield WI 53018, 262-646-2282. He accepts your choice to not vaccinate and offers holistic alternatives. However, I just received a letter this month (end of 2010) that he is giving up his medical office in order to reach a larger number of people with his holistic methods and his company, True Botanica Company. Lake Country Pediatrics has recently begun the transition fo assume the primary care activities at his office. According to the letter from Lake Country Pediatrics attached to Dr. Kamsler’s letter, Lake Country respects “every family’s right to make the best decision for their children.” You can contact Lake Country at the address/number listed for Dr. Kamsler in Delafield. 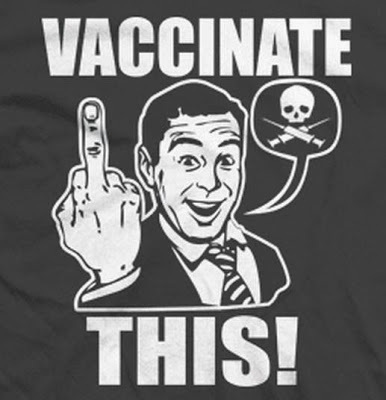 Posted in: Vaccines, Vaccines - Doctors Who are Friendly to Anti-Vaxxers.